Farm-to-table is one of those irritating culinary trends that is hard to really stay irritated by. Fundamentally, it's just so darn right: we should be eating seasonally and locally, we should be supporting sustainable agriculture and the preservation of heirloom vegetables. The most delicious food is the stuff that's been harvested (butchered, cultivated, fished) as close as possible to the kitchen that's cooking it. It's a delicious irony, then, that the proprietors of Walland, Tennessee's Blackberry Farm is the family that founded the chain Ruby Tuesday's, where the salad bar is anchored by shredded cheddar, diced ham, and macaroni salad. Blackberry Farm is a mega-luxury inn located on a remote 4,200-acre property that was farm-to-table before the hyphenate even existed, built as it is around a working farm from which the inn's extraordinary kitchen sources the vast majority of its ingredients. 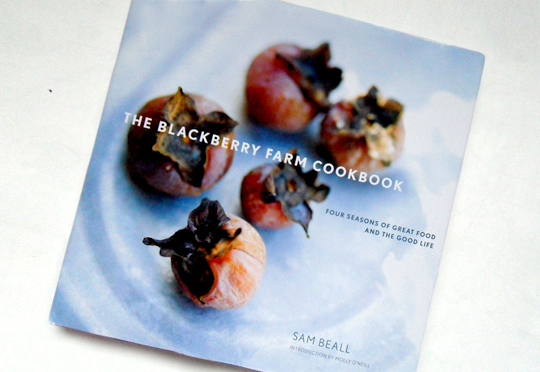 The Blackberry Farm Cookbook: Four Seasons of Great Food and the Good Life (Amazon ), by innkeeper (and Ruby Tuesday scion) Sam Beall, is about as far from Ruby Tuesday as you can get without coming around the other side. The Ruby Tuesday experience is not all that hard to recreate at home. (I've had days, and I'm not ashamed of it, when I've hacked up a head of iceberg into a mixing bowl, doused it in bottled ranch, and called it dinner.) But a little bit more challenging is the food on offer at Blackberry Farm, where the dining program is generally given context via comparisons to The French Laundry or The Inn at Little Washington. As it happens, Beall cooked for a number of years at The French Laundry, and the influence of Thomas Keller's The French Laundry Cookbook (Amazon ) on this volume is remarkable. Just as French Laundry pulled back the curtain on its restaurant's meticulous platings, including riveting sidebar backdrop on everything from farmer profiles to culinary philosophy, Blackberry Farm is about much more than the recipes. In interstitials that are some of the book's most interesting components, we're taken everywhere from the vegetable garden to the sheep fields, given close-up explanations of certain ingredients and techniques, and introduced to characters worthy of their own tall tales. Among others: a bearded mountain man who comes down from the Smokies each year to mend baskets and dispense wisdom, a farmer with a bean collection so vast his wife can't fit in the house, and a charcuterie master who gets so excited over silky white fatback that he does a little "lardo dance," swaying reverently over the slab. And as in French Laundry, all this backstory gives the recipes an immediacy that might not otherwise have been so apparent. It's not just truffles in the Tennessee corn-and-truffle flan; it's truffles painstakingly cultivated by Tom Michaels, a plant pathologist who lives not too far from the farm. It's not just a simple recipe for sauteed spring greens; they're foraged pokeweed and dandelion from the woods near the trout stream. Even if we poor sods cooking at home are hiking through the brutal aisles of the A&P rather than the foothills of Appalachia, the sense of place and season inherent to each dish is made explicit. 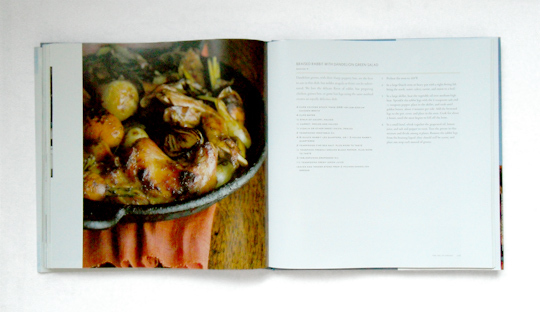 Appropriately for such a seasonal kitchen, then, the book is arranged according to the seasons (poetically titled: "Fall: The Amber Days"; "Winter: Smoke and Fire, Sausage and Ham"), and within each season the recipes are organized into menus — "Dinner in the Garden," "The Pig in Spring," "Fathers Frying Turkeys with Sons." Each season and each menu gets its own page or two of narrative, the prose generally leaning towards quasi-poetic vignettes and folksy descriptions of nature, but the frequent preciousness does give way to real charm. The one misstep is the absence of John Fleer, Blackberry's chef of fifteen years who left two years ago and who is the godfather of the farm's culinary thrust. "I wanted it to stylistically match the experience at Blackberry," Fleer said of his kitchen in a recent interview. "So as Blackberry changed, so did Foothills Cuisine." Rooted in rustic Southern preparations, but with sophisticated twists that never quite spill over into the snooty, the genre is undeniably seductive — flipping through the pages, I found myself fantasizing about pulling together an epic dinner party: silken black walnut soup, rye whiskey-cured trout, a roasted lamb bathed for thirty-six hours in a smoked-apple-and-cardamom brine. Or making any one of the five fried chicken recipes (most likely the version brined in sweet tea), the lemon chess pie, the kimchee collards. Of course, these ambitious delusions could be the fault of the stunningly beautiful photography — the saturated close-ups of seared pork belly and sweeping shots of foggy Appalachian farmscapes had me forgetting at times that there were even words on the page. 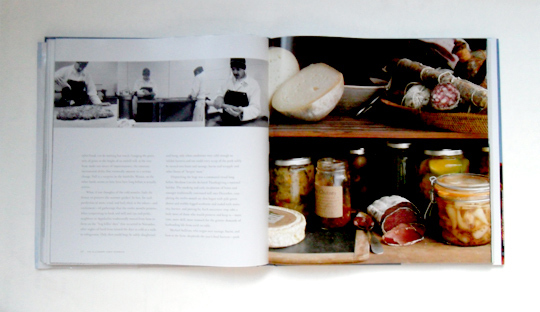 The Blackberry Farm Cookbook isn't a perfect book, but it's a beautiful one, both in execution and in spirit. It's fodder for both food and travel fantasies, perfect for reading when you're not in the kitchen. 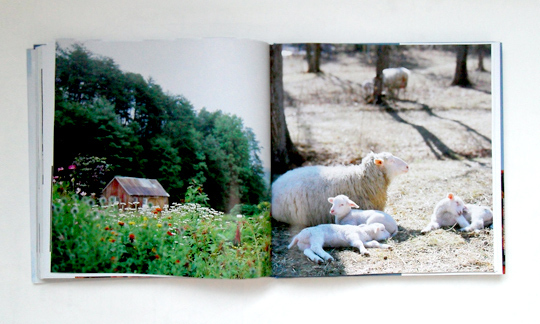 But if you can bring yourself to get the heavy pages bent, or to splatter olive oil on that photo of the baby goats, it's also worth reading when you are. Thanks so much for the kind words about the photography. Blackberry Farm is a magical place! We had a wonderful time doing the photography for the book -- especially because we were able to sample the food we photographed. It's delicious. You must try the pineapple upsidedown cake. It's unbelievable! Sounds great. Also, the first episode of Gourmet's new show will feature the farm. Great opening sentence: "Farm-to-table is one of those irritating culinary trends that is hard to really stay irritated by." There's also a spread on Blackberry in this month's Cooking Light magazine. Thank you for saying that. It is meaningful.